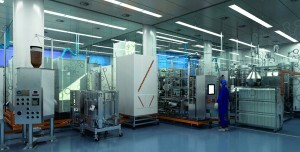 Recent articles have described how the debate on standardization is slowing down adoption of single-use technology (1). The Standardized Disposables Design (SDD) initiative is working to design simple standard single-use solutions for real-life examples (e.g., buffer bags). In reality, a buffer is a buffer whether it is made in Europe, Asia, or America, so in essence different solutions are not necessary for different end users. A buffer bag is not difficult to design, and it does not vary greatly in that design among suppliers and end users. PM Group, a global engineering design firm, has created a database of ~250 simple assembly designs that can be made by multiple suppliers. These designs can be implemented by end users and engineering firms and can be made available through supplier websites. PM Group does not dictate the fine detail of how bags are manufactured, but rather concentrates on connectivity and end-user strategy. As implementation of single-use systems becomes embedded in customers’ biomanufacturing processes, it effectively transfers responsibility for provision of a sterile process train away from drug-product manufacturers to suppliers of their single-use systems. Although this is a key benefit of single-use technologies, it does raise new challenges in terms of assurance of supply and business continuity. End users need to know that the components and systems they need during biomanufacturing will be available both reliably and continuously. Each vendor has its own business continuity and assurance-of-supply plans. However, by developing standardization in design, the market could both support the execution of such plans and even enable further evolution. Current customization levels among vendors can be as high as 75% of their business. Reasons for that come mainly from the genesis of single-use technology, which came first in precommercial manufacturing where a high degree of flexibility is necessary. As single-use systems become ever more prevalent for commercial processes, however, an industrial approach is needed. By standardizing designs, materials, and components, vendors of disposables could run leaner manufacturing operations of their own. Component stocking could be managed independently from orders, efficiencies could be gained from automated assembly, and faster reactivity could be achieved from a rationalization of designs in a vendor’s portfolio. Standardization also would lead to higher consumption of standard components, which would allow vendors to work with a smaller number of subsuppliers to ensure material consistency. Implementing a design-space qualification approach could further streamline component management and minimize the burden of change notifications. For end users, those benefits would become tangible in terms of shorter project timelines, decreased costs, easier dual sourcing, and simplified inventory control. Reduced options of five tubing sizes in two formats (C-flex 374 or equivalent and platinum-cured silicone). To target the most-used items, SDD targets assemblies that are common to most processes. Examples include tubing and filter sets, bags, simple mixers, and bag and sampling manifolds. Excluded items include bioreactors, ultrafiltration and chromatography systems, complex mixing systems, items with integrated sensors, and fill–finish equipment. The requirements of the fill–finish environment are very stringent, so PM Group decided not to focus on that area. However, we have seen significant interest in applying the same philosophy from fill–finish experts, so it is likely to be included in the future once quality concerns can be addressed. Filter integrity testing is also important. PM Group made sure that all capsule filter sets would be specified with 1.5-inch TriClamp fittings (Alfa Laval) to facilitate attachment to integrity testers. Finally, the firm decided that a simplified assembly code would consist of one letter (designating the tubing type) and three numbers. That allowed tubing types to be changed easily in the future in response to industry requirements. Step 2 — Initiating Supplier Involvement: We contacted most major disposables suppliers and asked them to draw up the assemblies. A major difficulty arose around the need for a genderless connector. We resolved it for the most part by choosing a component supplier that was considered by most end users to be independent. Step 4 — Top–Down Support: Following a presentation at the annual meeting of the International Society for Pharmaceutical Engineering (ISPE) in Tampa, FL, in October 2013, our activities began to receive more attention. Facilitated by the BioPhorum Operations Group (BPOG), an increasing number of companies have provided feedback to refine current designs, suggest new ones, and come up with additional requirements. For example Merck & Company suggested a quality dossier (see Step 7, below). Step 5 — Active Supplier Support: JM Bioconnect, a supplier based in The Netherlands, has been a strong supporter of SDD from the beginning of the initiative. The company saw SDD as an opportunity to streamline its own operations. JM Bioconnect decided to design a website through which end users could directly access component and system designs. This website (http://sus.jmbioconnect.com) has been instrumental in helping end users visualize the products and in showing other suppliers the ease with which such a website can be created. Step 6 — (Present Day) Engineering Project Benefits: The single biggest advantage that the SDD approach gives a biopharmaceutical engineering project is a clear picture of the single-use process train to all stakeholders from early design stages through procurement and implementation. With standard designs now available for most commonly used containers, filters, connectors, and tubing, process design becomes a systematic block-building exercise that can be completed quickly once a process is defined. 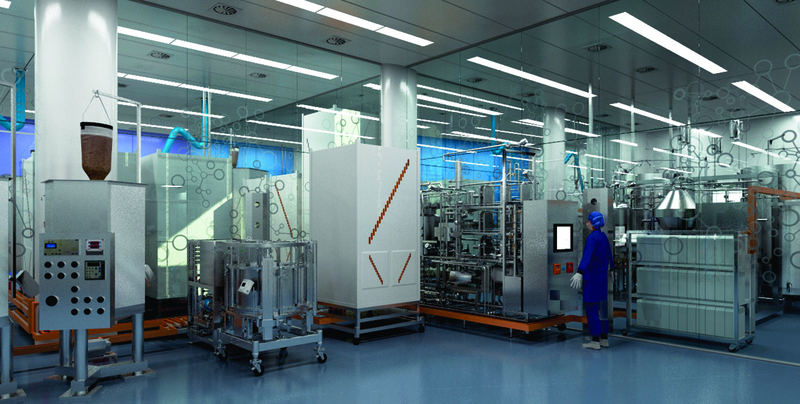 Single-use systems are receiving increasing acceptance and implementation in biopharmaceutical processes. However, broader acceptance of standardization remains a hotly debated issue. 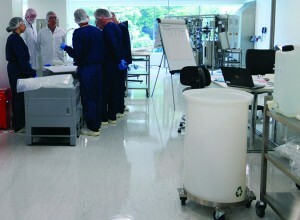 Process owners need to perform in-depth studies on how disposables can be used in their processes. Apart from giving rise to a fairly large number of bespoke designs, those studies require significant effort and resources on the part of clients, suppliers, and engineering design firms. Standardization could effectively save companies on resources and labor. The two PM Group projects that have used SDD both have benefited in terms of time saved on design. Generating a parts list for supporting procurement takes a cue from traditional stainless-steel designs, in which drawings use an automated quantity-extract tool for material take-offs. SDD goes one step further here by defining tubing lengths in a design template and providing overall tubing lengths along with a parts list. Although it is relatively straightforward to use SDD in designing an entire bioprocess train, some process steps do need bespoke components that are unavailable as standard. However, including such components as SDD parts on early design drawings — process flow diagrams (PFDs) and piping and instrumentation diagrams (P&IDs) — requires spending extra design time on these components well in advance. In one project using the SDD tool, an interesting aspect arose at the early design stage. The environment, health, and safety (EHS) group needed a rough estimate of solid waste generated by upstream (biohazardous waste) and downstream (purification) processes to help them determine the necessary size of decontamination, shredding, and incineration capacities on site. The SDD initiative exceeded their expectations by providing precise information down to tubing types and lengths coming out for disposal with every batch. When tied in with the process schedule, that information helped them determine how much waste would be generated each day. Having structured systems in design and execution of biopharmaceutical projects is highly desirable, with obvious benefits to stakeholders. SDD is poised to be an important aid in such projects as its acceptance and implementation gain momentum. Thanks to SDD, engineering projects will benefit, with more advantages over the coming years as its acceptance and implementation gain further momentum. 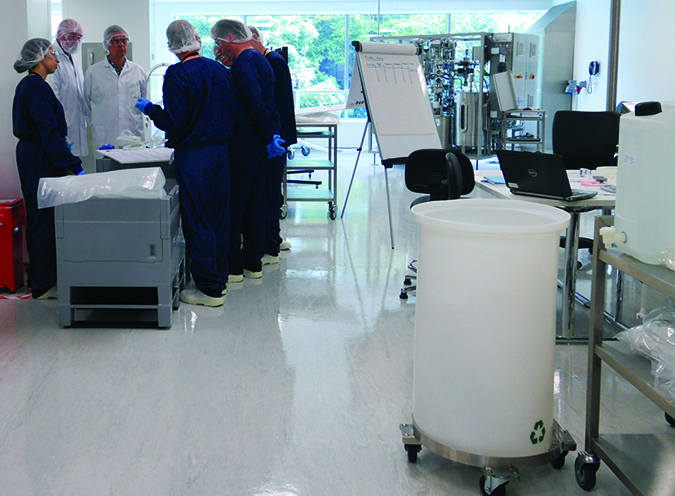 Step 7 — The Quality Dossier: Qualification of single-use systems varies greatly throughout the biopharmaceutical industry. Certain pharmacopeia tests have been widely adopted (e.g., bioburden, endotoxin, and sterility). But evaluation and documentation of other quality attributes (e.g., closure integrity, extractables and leachables, and particulate burden) are far from standard. Much activity is ongoing among standards agencies and end-user forums, but that activity relies on collaboration of vendors, agencies, users, and regulators, making it a time-consuming process. Those efforts will undoubtedly bear fruit, but opportunities exist to improve the situation and move toward a standard approach. Successful design standardization facilitates a quality dossier: a collection of performance attributes, compendia, and other test results that summarize the critical characteristics of a single-use system. Vendors could benefit from performing such tests one time, then documenting the results in a standard format. They would no longer need to address a continuous stream of questions and requests for additional information. End users would realize benefits associated with streamlined implementation and an ability to compare similar products from multiple vendors. Quality-dossier information is already generated by vendors upon user request. Completing such work up front shifts the paradigm from qualifying a part for a given application to selecting a qualified part for that application — a subtle difference that can make a big impact. Data Sharing: Taking the approach of Step 7 even further, information sharing could even extend to sharing of qualification data. In the case of buffers and media, for example, many leachable studies have been repeated multiple times with the same contact solutions in the same storage conditions. The results of customized studies (owned by end users) become confidential and cannot be used to facilitate other implementations. Could sharing forums exist for end users to effectively confirm the suitability of certain contact materials with certain contact solutions? Such an approach would certainly limit the revenue to vendors from their validation studies. However, it would also facilitate new business opportunities by easing implementation of disposables. End users would benefit by minimizing both the cost and time needed to introduce single-use systems for established applications such as buffer holding. This approach may be considered too radical at the moment, but now could be the time to open such a debate. 1 Gladd T. Is the Single-Use Standardization Debate Slowing Down Adoption? BioProcess Online 16 March 2015; www.bioprocessonline.com/doc/is-the-singleuse-standardization-debate-slowing-downadoption-0001. With over 25 years of experience in biomanufacturing at CMC Biologics, Wyeth (now Pfizer), Elan, and Lonza, corresponding author David A. Wolton (dave.wolton@ pmgroup-global.com) has been a biopharmaceutical consultant at PM Group since 2012, focusing on process optimization and disposable applications. Luke Heaven is director of marketing for fluid management technologies at Sartorius Stedim Biotech SA, Scott McFeaters is a senior engineering specialist at Merck & Company; and Mahesh Kodilkar is a process lead in biopharma projects at PM Group; www.pmgroup-global.com.